Have you ever found yourself waking up each morning with a feeling of depression and defeat? Have you experienced times where you felt your health habits were out of your control, that you were a slave to your appetite? I found myself in that position, at some level, for more than two decades. On the left side of this picture you see a guy who was spiraling into depression and dealing with increasing health issues with each passing week. 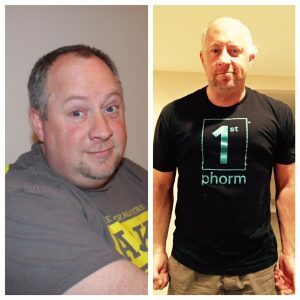 On the right side you see a guy who took control of his health and now takes on each day (well, most days – ha) with optimism and positive expectation instead of dread. Being overweight has plenty of physical challenges but it also has many mental and emotional challenges. For me, the mental side of things was significant. I didn’t even realize how bad it was until I started to lose weight, exercise and get healthier. I thought the way I was feeling was just the way it was. Studies have shown that obese people are about 25% more likely to experience a mood disorder like depression compared with those who are not obese. Data from the National Health and Nutrition Examination Surveys reported that 43% of adults with depression were obese, and adults with depression were more likely to be obese than adults without depression. Because of the depression and lack of motivation it wasn’t easy to go to the gym. It wasn’t easy passing by Taco Bell and the convenience store on the way to and from the office to pick up my favorite comfort food. But, the more I said ‘NO’ to staying in bed and eating the wrong things and started saying ‘YES’ to the gym and better food choices the more the depression lifted and the more motivation I had. Community – I joined a health challenge that was organized by one of our local hospitals. This 12 week challenge required weekly weigh ins and connected participants through social media. Because of the community, encouragement and accountability it was much easier to start my health journey. Goals – In the beginning I didn’t set realistic goals and because of that I was easily and regularly discouraged. But, when I changed my mindset from a “quick-overnight-weight-loss” view to a “entire-long-term-lifetime” view it allowed me to start setting more realistic and achievable goals. Education – I found blogs, books, podcasts and YouTube channels that taught me about exercise and diet. With everything I was learning I tried to keep an open mind and discover the approach that worked for me. Food – Understanding the impact that specific types of foods had on my health, specifically my emotional health. I realized that there were foods impacting my emotions as much as physical body. Supplements – I experienced there were supplements that helped me mentally and physically. Over the course of time I tried several different supplements and discovered the best ones that helped me achieve my goals. The Mayo Clinic reports the following ways that exercise helps. As you make the decision to exercise each day you’ll feel better emotionally. When you make the decision to eat right, even it’s just a little bit each day, you’ll feel better emotionally. Don’t believe the lie that exercise and diet don’t affect how you feel mentally. You have what it takes to exercise tomorrow. You can choose to eat healthy and not let the cravings control you. Make the decision today that you will start, you will take steps forward. And then make the decision that even if you stumble and fall off the wagon you will get back up and start moving forward again. If you have questions or just need someone to encourage you, I’m here for you!